tossed out what’s old, and created screenshots of the ones I love best. I’ve got links to each of them in the paragraphs below, but if you want to search for others like them you can simply click on Google Docs in order to access the template gallery. Once you’re at the Google template gallery, use keywords to find the types of documents you’re looking for. Click the preview button and, if you think it fits the bill, select Use This Template. The file will download with the name “Copy of [file name]." I kept my project management Google docs together by creating a file just for them on my Google drive, and each one of them is stored there—a gallery of Google favorites. 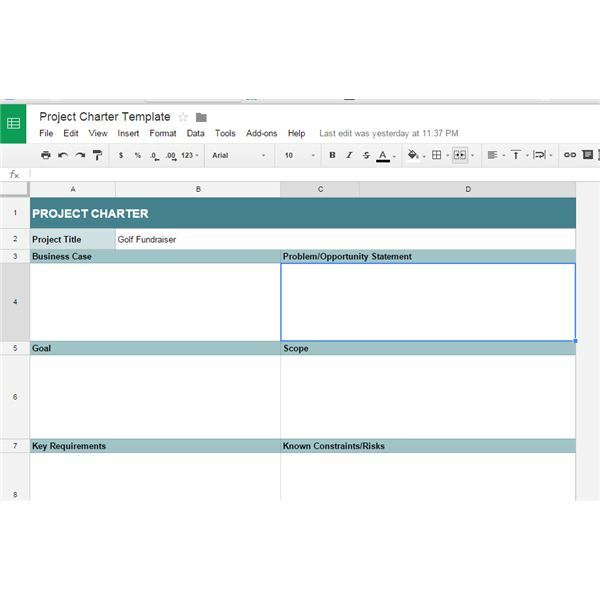 At the beginning of every project you need to complete a charter statement. You can find one by downloading this Project Charter document created by Matt McCarty. It puts down in writing who is authorizing the project and offers an overview for the stakeholders. First you’ll describe your opportunity or the problem, and then you can define your goal. There is an area to define scope, although you will also want to complete a scope statement subsequently. The charter should identify constraints and risks, as well as the project sponsor and manager, the members of the project team, and the expected start and end dates. I like to use the second page of these little workbooks to insert links to important resources, contact information for team members, and whatever seems useful. will upgrade the main electric panel and remove a subpanel, and he will install wiring for a garbage disposal in the kitchen, but he will not install a GFCI-wired outlet in the bathroom. 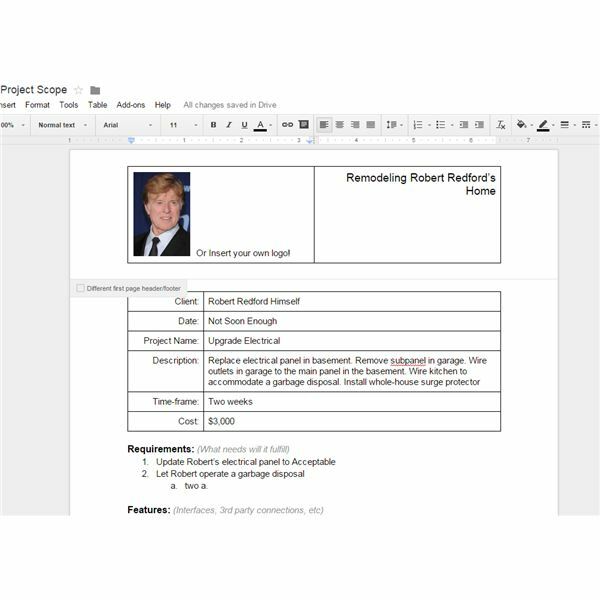 On this Project Scope form created by Boydell, the first thing you will want to do is delete the “OrbSix" logo and insert your own at the top of the sheet. I opted for a photo of Robert Redford. In the spaces of the form you will describe just what your project is intended to cover. You can list Requirements, Features, Additional Resources Needed, Development Notes (Implementation), and Questions. There is a place at the top for the project cost, but if necessary you can break costs down below. Every person who has a management role on the project should sign off on this scope sheet, and you will have to add the signature lines on your own. Publications. Once you make it your own, you can type at the top, above the colored heading, the name of your project. For each of the risks you anticipate, you can estimate the seriousness, the possibility, the opportunities to mitigate them, the potential costs, and more. resources—human or material—to document how much they cost the project and also whether the resource is overcommitted. 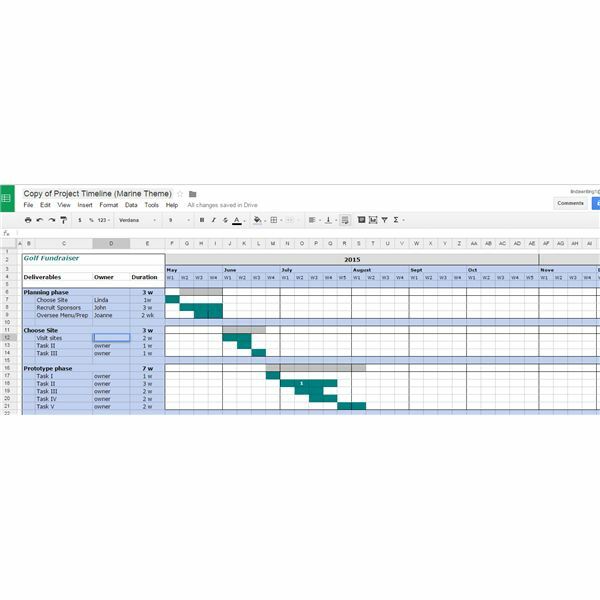 This resource timesheet by Adam Thomas will do just the trick. 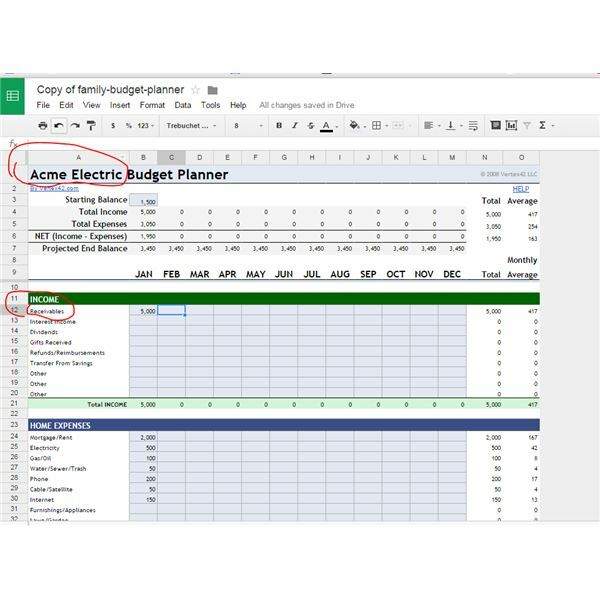 You can take the resource sheet and use it just as is, or you can use a few simple Excel-type tricks to enhance it. With any Google docs, however, you have to be mindful that you don’t type into cells that contain formulas, or you will upset the usefulness of the spreadsheet. For example, once I downloaded this, I moved it to my Project Management folder. If you look at the worksheet tabs, you can see there are sheets for Resource Summary, Resources 1 through 4, and a Data tab. I immediately dragged the Data tab to immediately follow the Resource Summary. Then, I entered the names of my staff on the Resource Summary timesheet. I have John Smith, Tom Jones, Mike Brown and, of course, Robert Redford. Resource summary, put your cursor in the Box for John Smith ( your Resource 1 name), and hit Enter. John’s name will immediately transfer to Resource Sheet 1. You can even rename the tab for the Resource 1 Worksheet by right-clicking on it and naming it John Smith. The Data tab gives you the categories of projects or tasks that are utilized to account for your people’s time. Click on that tab and you will see Project Management, Development, Meetings, Admin, and Personal. If you move to John Smith’s worksheet tab, you will see under the heading for Discipline that those same categories are listed. You can change the categories on the Data tab—I deleted Admin and typed in Training—and now Training shows up as an expenditure category. On the top of John Smith’s resource sheet, the only thing you will change is his pay rate, what percentage of his time he must account for, and the number of hours that entails. Note there is a formula in that latter box, so if I put in there that John only has to account for 75 percent of his hours, the 160 will change to 120. 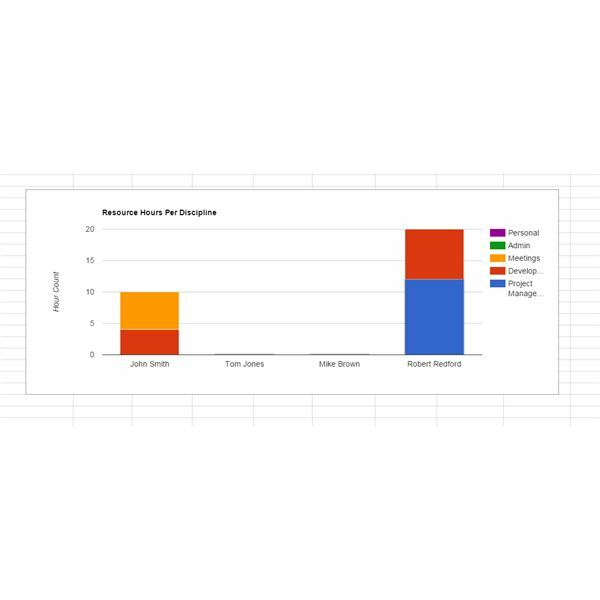 As you enter time worked, doing what on each task, a bar chart will build for your resources on the Resource summary. Don’t forget, too, that you can name your resources after materials available. As you become increasingly familiar with this great spreadsheet, you will find it increasingly indispensable. name of your project in the upper left. Then you can substitute your own people’s names in the cells below Division Personnel. Enter how much of their time will be devoted to the project and their annual cost. 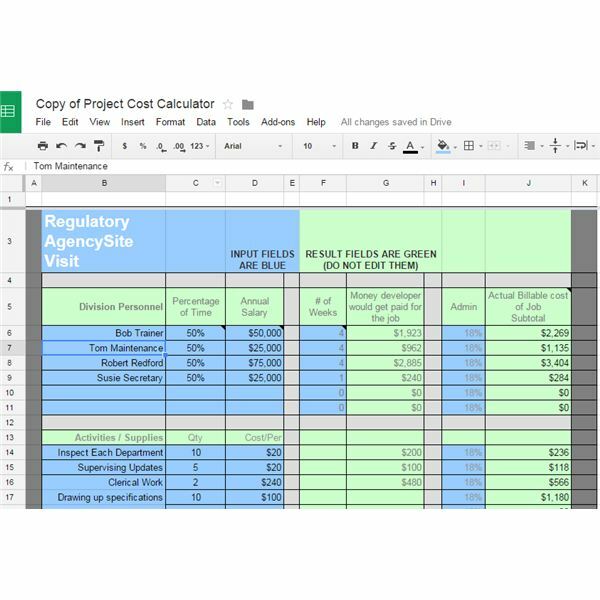 Add in how many weeks you expect them to be on the job, plus your administrative overhead, and the project cost calculator tells you how much you will spend—on people and also, if you utilize the spaces below for Activities and Supplies, Training, and Travel—for the project overall. novice bookkeeper. Don’t get messed up in one of those fancy spreadsheet applications where one wrong turn takes you on a vacation at Motel Hell. Instead, you can just download this sheet and type the name of your business at the top—in our case, Acme Electric—over the word “Family"–and you'll think you're staying at a Holiday Inn Express. In the top section, where it says “wages," change it to Receivables. In fact you can change any of the category names in white cells on the left-hand side. Just do not type in cells that have formulas. As I entered some business expenses—yes, I modified “Home Expenses" to “Accounts Payable"—your figures will add up automatically. There’s also a help tab, much worth the time it takes to read it. And yes, there's even a functioning balance sheet. useful calendar to block out dates for the various steps of a project. Once you download it, you will need to change the dates at the top, and then you can enter your project name and tasks. You will then use the little paint can icon at the top to fill in or clear the blocks when you want to schedule stages of the project. Imagine sharing this project timeline with other people on your team. 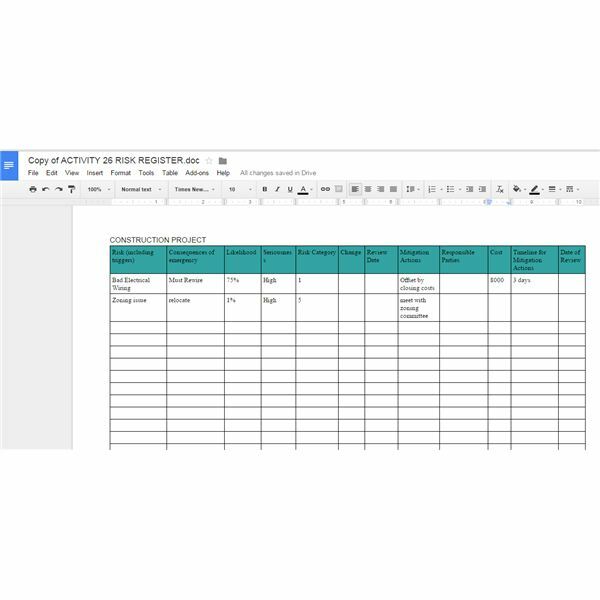 If you’re planning a Golf Fundraiser, for example, and Joanne is in charge of the menu planning including food purchasing and preparation, you can share this Google Doc with her and she can apply her own estimations of time available. That gives you a basis for a dialogue about the project. You can also insert numbers into the squares and reference them in annotations below. charts. However, this one created by Doli Stepniewski will make you give a sigh of relief. Even though it's very basic–it's more of a bar chart–it provides that visual kick that works so well at meetings and in presentations. You simply type in the names of your tasks and the dates, and the Gantt chart updates from the ones you’ll see when you first download this form. You can even use it as a project portfolio—instead of project tasks, type in the names of your projects, with their start and completion dates, for a dashboard view of your projects’ status. 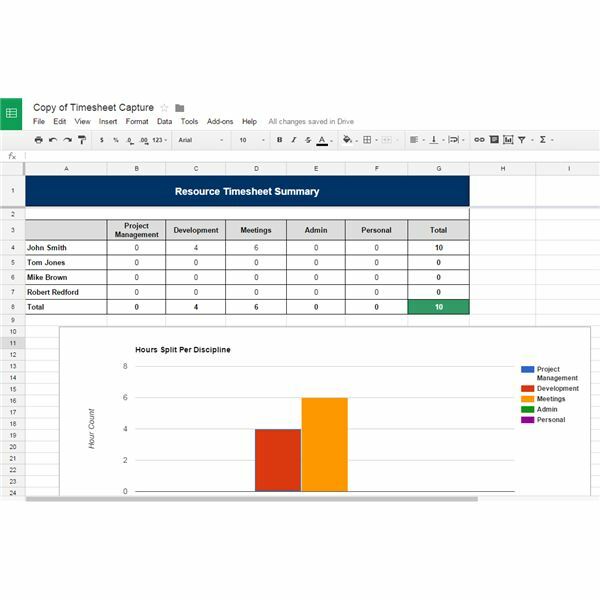 This nifty-looking form is one of those ingenious Google docs that serves as both form and spreadsheet. In the first view, you can see the Work Recorder form in which the user checks off which category the work request falls into. This was one of the forms from my original review of Google Docs that I couldn't bear to replace. 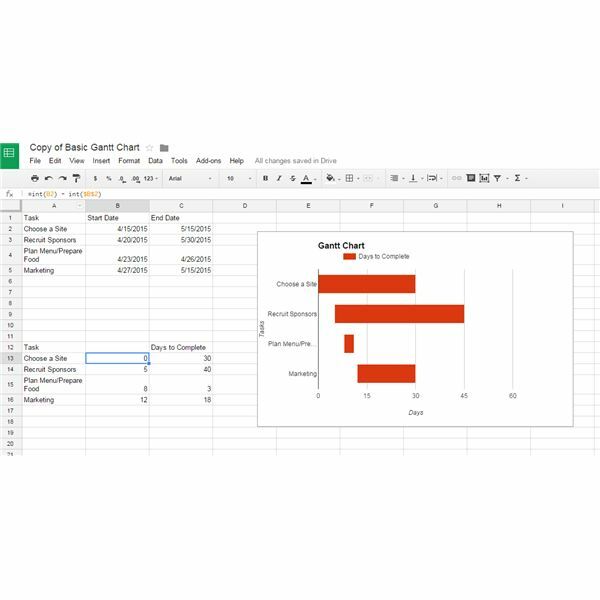 It represents that genius form that Google Docs offer, the questionnaire that turns into a spreadsheet. Below that you’ll see spaces for room number, date of request, date of task completion, and assigned staff. Below that is yet another checklist so you can indicate the type of labor required to complete your task. You can share this form with all your managers, and when maintenance is needed Rick or Joe or whoever fills it out and submits it. 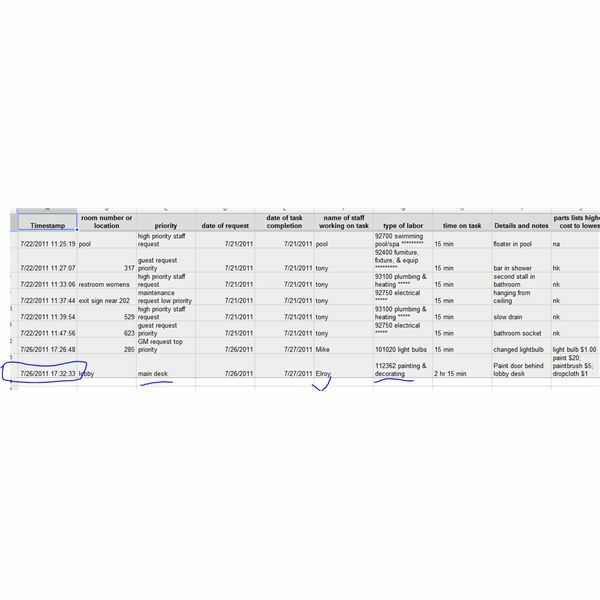 Then, on the backside view where the spreadsheet is, the submitted data is listed in Excel-type columns that can be sorted however you want to analyze it. You can even use this form to propose project change. The spreadsheet provides a date and time stamp that will mark every update and a way to notate its status. All you need to do is change the headings on the spreadsheet and your form will be updated. It's really easy to use. Once you download it, you see a spreadsheet-type form. Click on Form and then Go to Live Form. You will see a questionnaire, and as you fill in answers it populates the spreadsheet. On the right-hand side, you'll have the ability to choose a theme for your form. form. It is a straightforward business dashboard report that allows you to get a clear snapshot of your total employee counts, transactions, sales, days open for business, and quotes or estimates provided. 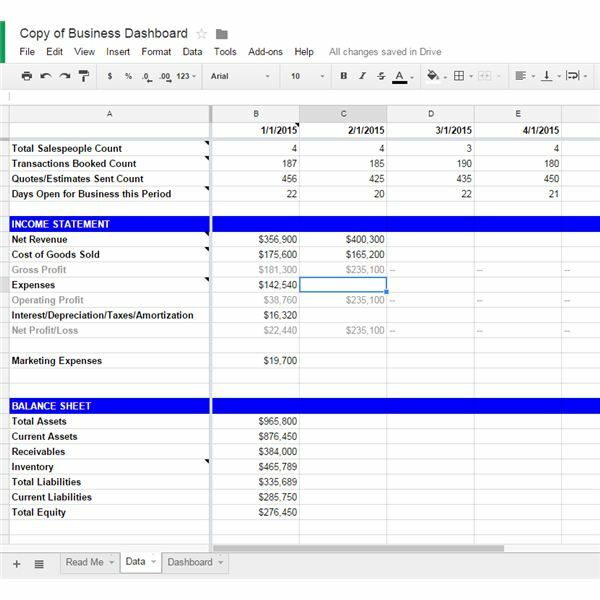 You can also document your net revenue, cost of goods sold, expenses, depreciation and amortization, plus a balance sheet. Just type in the current month/year at the top and start entering figures on Tab 2. The figures will translate to a Dashboard that’s available on Tab 3. And don’t forget to read “Read Me"—Tab 1. 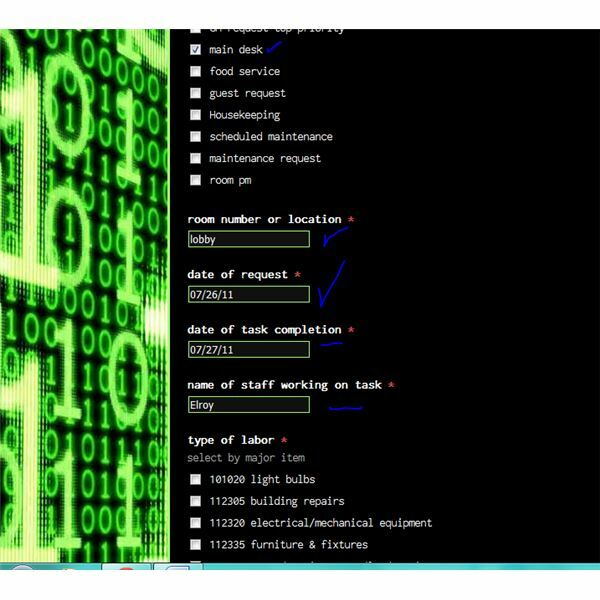 Remember, as always, not to type in the cells with formulas! As you change the dates on Tab 2, they will update on Tab 3. And the Dashboard (Tab 3) will automate from the figures you enter on the Data tab (Tab 2). It was created by "Lon," maybe a Mad Man in his own right. The beauty of Google docs is that people on your team can share them even if you’re not on a shared server. You can decide who can just view them or who can actually perform edits. All edits will be saved, even if two people work on the same spreadsheet at the same time at different locations. All of these sheets are pretty intuitive and user friendly. Remember, for project managers, it’s not about changing the world—it’s about organizing it. 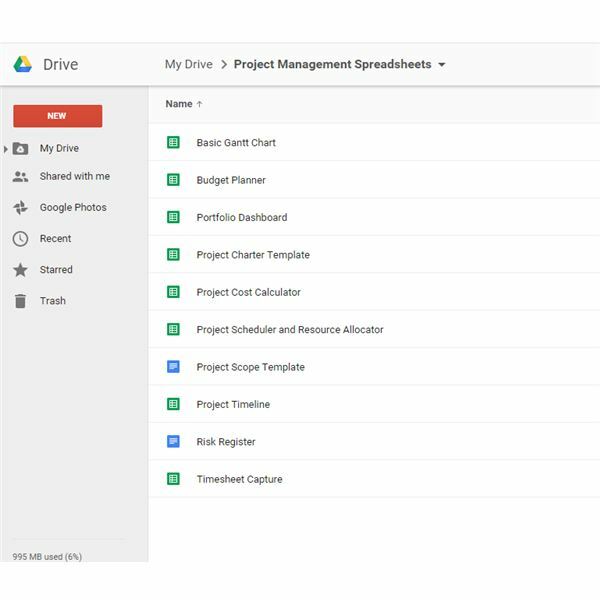 Bright Hub Project Management also offers Google Docs: The Project Manager's New Best Friend for more information on working with Google Docs. If you're looking for more sample forms and downloadable templates, check out Bright Hub PM's resource guide Over 50 Free Project Management Templates and Sample Forms. The writer has managed many projects and has thoroughly explored Google Docs. All Google Doc screenshots taken by the writer.